The saying “Go fly a kite!” takes on a literal meaning every January 14 in India. 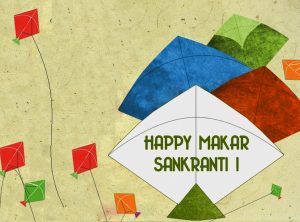 This date marks Makar Sankranti 2017 or Uttarayana: the kite flying holiday in India in the state of Maharashtra. Makar means Capricorn. Sankranti implies a movement or change of location. The reason for the celebration is the entry of the Sun into the sign of Capricorn in Vedic Astrology (which uses the sidereal zodiac). Being a lunar based system, we pay more attention to the placement of the Moon rather than the Sun in Vedic astrology or Jyotish, but this day is a marked exception. On Makar Sankranti 2017, the Sun begins its Northernly movement in the heavens. This commences the beginning of longer and warmer days. Makar Sankranti is a festival which propitiates Surya, the Sun God, for all the gifts the Sun bestows on us, especially for helping the crops and the harvest grow so abundantly. Uttaryana marks the transition from the “night” of the Gods (dakshinayana) to the “days” of the Gods. 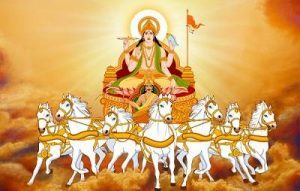 When the Sun enters Capricorn on Makar Sankranti 2017, it is entering into a sign ruled by Saturn. Saturn is considered to be the child of the Sun in astrological lore. Yet, the two have a strained relationship. For this month (and next when the Sun is in Aquarius, which is also ruled by Saturn) the son (Saturn) must take care of this father (Sun), who is a guest in his home. 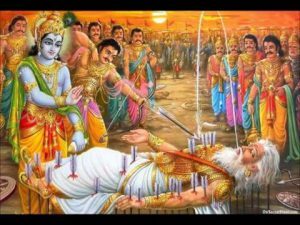 The origin of this holiday dates back to the epic the Mahabharata, in which the hero Bhishma lay wounded on the battlefield, with arrows piercing his body. However, he persevered until the Sun began its Northern movement and then chose to die. It’s an auspicious day for spiritual journeys or for saints to leave their bodies. People will celebrate Makar Sankranti 2017 in Maharashtra or Gujarat by climbing on top of tall building and flying colorful kites. They engage in the friendly competition of trying to “cut” another person’s kite from the air. People give their friends and relatives ladus (sweets) made from white sesame seeds and jaggery. Residents either receive or do self-massages with sesame oil (the traditional oil used in Ayurvedic medicine) are also given. It is believed that sesame originates from Lord Vishnu’s body (the preserver of the universe) and that engaging in specific rituals with sesame seeds and sesame oil will rid the body of impurities. 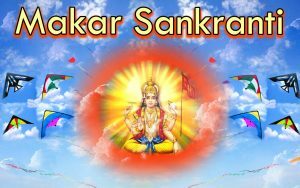 Lord Vishnu is also associated with Makar Sankranti. While Bhisma was waiting for the Sun to move from dakshinayana (Southwardly movement) to uttaryana, he spent the time that he was injured instructing his nephew, King Yudhisthira. 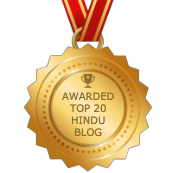 Bhisma was the epitome of dharma, or right action. Thus, he taught Yudhistira the Vishnu Sahasranam (the 1,000 names to Vishnu). Vishnu is said to be the preserver of the cosmos and an upholder of dharma. In the state of Gujarat, people celebrate the holiday that they call Uttarayana by having the elders in the family system give gifts to the younger members. Scholarships are also offered to students on this auspicious day. 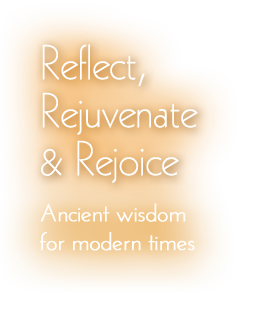 These are often in the subjects of philosophy and Jyotish (Vedic astrology). Cows, which are the sacred animal in India due to their quality of providing nurture for others, are specially fed. In the state of Punjab, the residents celebrate on the night of the 13th with a large bonfire and offer sweets into the fire. The night of the 13th is known as Lohri. Then, on the 14th, which the Punjabis call Maghi, they engage in traditional dances and partake in a feast. In Uttara Pradesh, the day is called Khichadi, which is the traditional food made from basmati rice and moong dahl. Additionally, in Madhya Pradesh, the citizens celebrate the day as Sukarat. Whatever region of India people reside in, they celebrate with sweets, kites, and with friends and family. Starting the day with the dip in the holy Ganges (pronounced as Gung-ahh) River is done wherever possible to commence the auspicious day. Surya, the Sun God, is also worshiped throughout the country. Fire ceremonies or yajnas are also a common occurrence. People also give donations of sesame seeds, wheat, jaggery, corn, clothing, and money to the poor. The Sun is responsible for illumining everything around us and for shedding light on us, both literally and figuratively. Surya, the Sun God, is worshiped by many astrologers to help them illumine the lives of others. You may wish to chant the Gayatri Mantra on Makar Sankranti 2017. This is a mantra to Surya (the Sun). To begin the day, you may wish to give yourself an Ayurvedic oil massage with sesame oil. You may also enjoy reciting the Vishnu Sahasranam during the day. Be sure and spend the day joyfully with your teachers, family, and friends.